A spike in U.S. equity market volatility coupled with the sharp decline in value across sectors over the last quarter of 2018 had a tangible impact on equity underwriting volumes for the period, with total proceeds from IPOs and FPOs in the country shrinking 30% from the figure for the previous quarter. With equity capital market deal volumes in Asia and the EMEA region being affected to a much lower extent, this resulted in the market share of the five largest U.S. banks shrinking to the lowest level in seven years. According to data compiled by Thomson Reuters, the U.S. banking giants helped raise just 30.4% of the $134 billion in total proceeds for the quarter – a figure that is substantially lower than the average market share of 37% over the previous seven quarters. 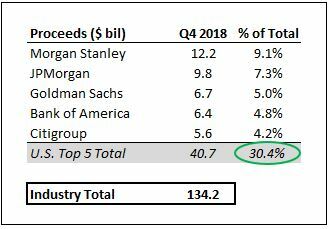 In fact, this is the lowest combined market share figure for the five largest U.S. banks since Q4 2011. Understandably, the poor market conditions will translate into notably lower equity underwriting fees for each of these banking giants. Total equity underwriting fees for the industry are estimated to have fallen from $4 billion in Q3 2018 to below $3.6 billion in Q4 2018, while the total fees for the five largest U.S. banks is expected to fall from $1.6 billion in the previous quarter to below $1.2 billion this time around – a sequential reduction of 27%. The chart below details the market share of each of the five largest U.S. investment banks. Morgan Stanley regained the top spot in the list after Goldman held the #1 position for Q2 and Q3. However, Goldman edged ahead in terms of total deal volume for full-year 2018, with an exceptionally high market share figure of 11.6% in Q3 2018. The chart below captures the total size of equity capital market deals completed by the five largest U.S. investment banks since Q4 2017. The green-to-red shading for figures along a row show the variations in deal size for a particular bank over this period. Equity underwriting volumes for individual banks were taken from Thomson Reuters’ investment banking league tables for the last five quarters. The table below captures the respective market shares for each of these banks over this period. 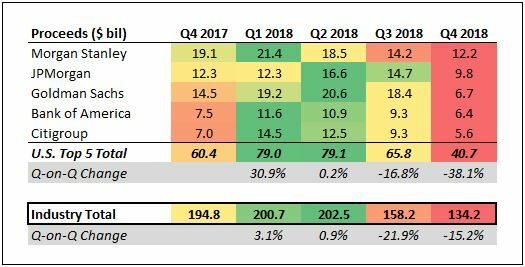 The green-to-yellow shading for figures in a quarter should help compare the relative standings of these 5 banking giants in a particular quarter. It should be noted that the largest equity capital market deals (IPOs and FPOs) employ more than one investment bank, and the market share figures here factor in the proportion of the total proceeds generated by a particular bank. As detailed above, Thomson Reuters estimates that the combined equity underwriting fees for these five U.S. investment banks shrunk by 27% sequentially – far worse than the 12% decline in total fees for the industry. Notably, JPMorgan grabbed the largest wallet share (9%) among all investment banks for the second consecutive quarter – something that can be attributed to the fact that the bank played a part in more equity market deals (70) that closed over the period than any other bank. That said, JPMorgan’s Q4 2018 fee figure is expected to be 29% lower than the figure for the previous quarter. While Goldman helped raise less equity capital for companies in Q4 compared to Morgan Stanley, both banks played a role in an equal number of deals (64). However, with Goldman playing a larger role in several key deals for the quarter, the expected equity underwriting fee for both these investment banks is identical. This represents a sequential decline of 24% for Morgan Stanley, and 17% for Goldman Sachs.